Patrick Wilson is an American artist known for his luminous, sumptuously colored abstract paintings composed of lines and quadrilaterals. Born in Redding, California in 1970, Patrick earned his BFA from the University of California, Davis in 1993 and his Masters of Fine Art degree from Claremont Graduate School in Claremont, California in 1995. Patrick Wilson’s abstract paintings are composed of richly layered geometric forms—lines, squares, and rectangles. Conceived with the ideas of beauty and pleasure at the forefront, the artist meticulously deploys a palette of potent colors that range from muted grays and blues to intense reds, bright greens, yellows, and deep purples. The result is an opaque architectural and chromatic pattern, made up of astonishingly subtle tonal shifts as well as of hard-edged color fields. 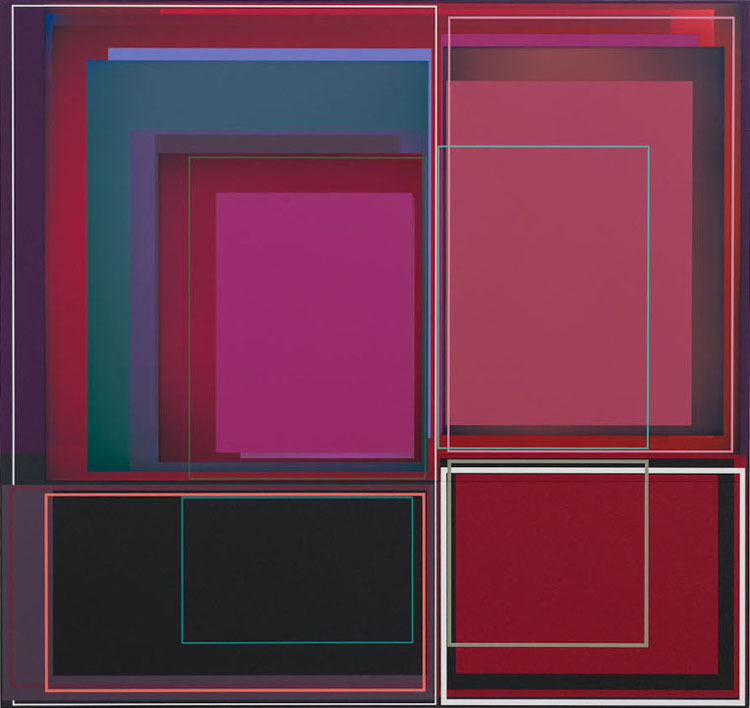 Wilson’s playful mixtures of colors, employing literally dozens of nuances demonstrate breathtaking risks, as the resulting variances in tone are always alive with stunning surprises. In his practice of creating abstract paintings Patrick Wilson uses humble tools – he applies acrylic paint with a drywall knife to drag layers of translucent and dense coats of paint across the canvas to progressively build rectilinear spaces of line, pigment, light, and texture. Superimposing what seems like disarmingly easy geometric forms, on top of, beside, or inside each other, Wilson devises complex modular compositions which request careful observation, rewarding viewers who look closely. 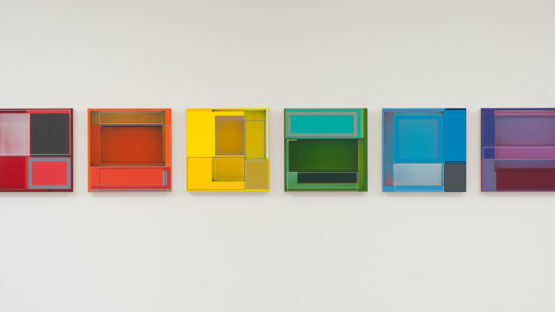 Despite the obvious accuracy of Wilson’s method, the artist produces pieces by intuitive exploration of the relationships between color and shape. This playful attitude is the most obvious in the titled of Wilson’s paintings, which often connect his works to other, more quotidian, creative and sensual experiences such as cooking and dining. In his series of works, The Chandler Paintings, the artist has named each piece after a different novel or short story of the American novelist and screenwriter Raymond Chandler, paying homage to the writer’s depiction of the city of Los Angeles. All the paintings from that series of works were ranging in size from 17 inches square to over 7 feet high. The artist describes himself as a “studio rat” and “painting junkie”, while he says that his new body of work is “organic”, because the paintings appear to be in a constant state of slow motion or growth. In one of his recent solo shows Steak Night held at Susanne Vielmetter Los Angeles Projects in 2014, Patrick presented his latest paintings composed of solid geometries, destabilized as they undulate with a vibrancy that contradicts their architectural references. 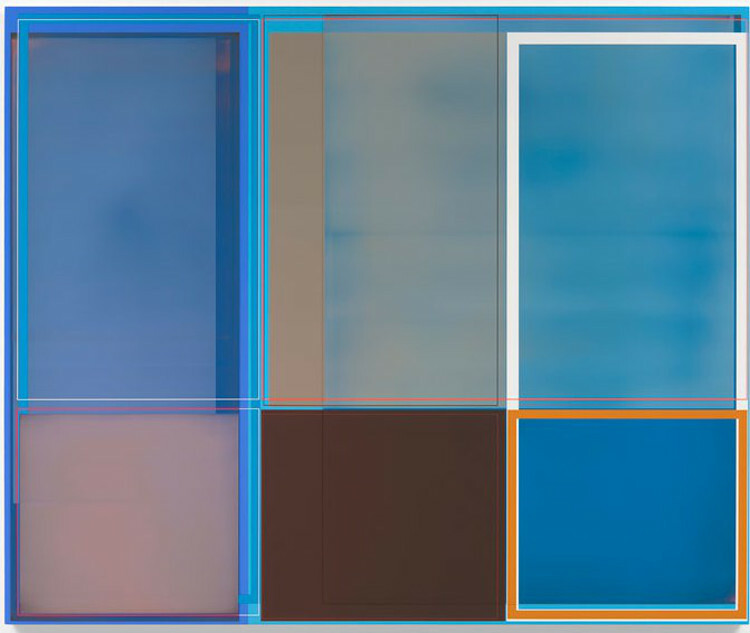 Patrick Wilson’s work has been exhibited throughout the United States, in many prestigious institutions and galleries, including Ameringer McEnery Yohe, New York, Marx & Zavattero, San Francisco, Susanne Vielmetter Los Angeles Projects, Culver City, San Jose Museum of Art, San Jose, and Rebecca Ibel Gallery, Columbus, among others. Wilson’s work is included in many prestigious public and private collections including the Columbus Museum of Art, Columbus, Crocker Art Museum, Sacramento, Smithsonian Institution, Washington, D.C., Long Beach Museum of Art, Long Beach, and the San Jose Museum of Art, San Jose, CA, to name a few. Patrick Wilson currently lives and works in Los Angeles, CA.